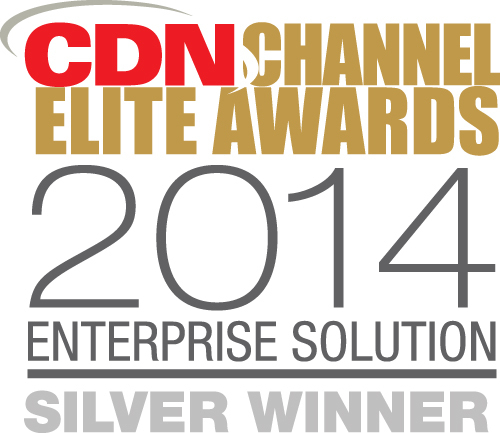 RefineCo, an Alberta-based technology firm, was honoured to win silver at the 2014 CDN’s Channel Elite Awards for the Best Enterprise Solution. The awards gala was held on September 9, 2014 at the Hazelton Manor in Vaughan, ON with nearly 200 attendees. These highly competitive awards attract hundreds of solution providers from all across Canada, making the first time winner extra proud. CDN’s Channel Elite Awards recognizes IT Solution Providers for their innovation, leadership and commitment to creating business value for customers. “Channel Elite Awards are the hardest award to win in the high tech channel. Companies must show true innovation while also outperforming their competition. They have to show a lot heart, dedication and success in delivering creative solutions” said Paolo Del Nibletto, the Editor of CDN – Computer Dealer News. The Best Enterprise Award honours the solution provider that has created the most innovative problem solving hardware, networking, mobile, cloud or software-based solution for an enterprise, defined as a company or department with 251 seats or more using the solution. RefineCo won the award for the Electronic Well File (EWF) solution that was developed for a large Canadian oil and gas company. This solution is a unique combination of technologies that allows the company to access well records and documents using a single intuitive interface. The EWF solution takes powerful industry tools such as FAST Search, Microsoft SharePoint, and the Professional Petroleum Data Management (PPDM) database and packages them in an interface that is simple and familiar. Most importantly, this innovative solution goes above and beyond by focusing on the user experience without compromising on robust, scalable enterprise architecture. Having been listed in the 2014 Branham300’s Next 50 Canadian Information and Communication Technology Companies earlier this year and selected as a finalist in Calgary Chamber’s Small Business Week awards for Breakout Business, RefineCo is proving that they are certainly a Canadian IT company to watch for. RefineCo has experienced tremendous growth over the last year – doubling both staff and revenues. RefineCo is a full-service technology consultancy and development firm with a special focus on Enterprise Content Management (ECM). Their offering spans requirements definition, solution architecture, development, hosting, training, and managed support. RefineCo knows technology, but they also have a lot of domain knowledge across a variety of industry sectors; especially the energy industry. They have been working with clients in oil and gas for many years. RefineCo understand challenges such as managing a well file, sharing documents between distributed teams and EPC’s, and setting up document management and retention strategies. For more information, please visit www.refineco.com.